From women to tenants to 18-year-olds—the evolution of the city's voting rights since 1834. 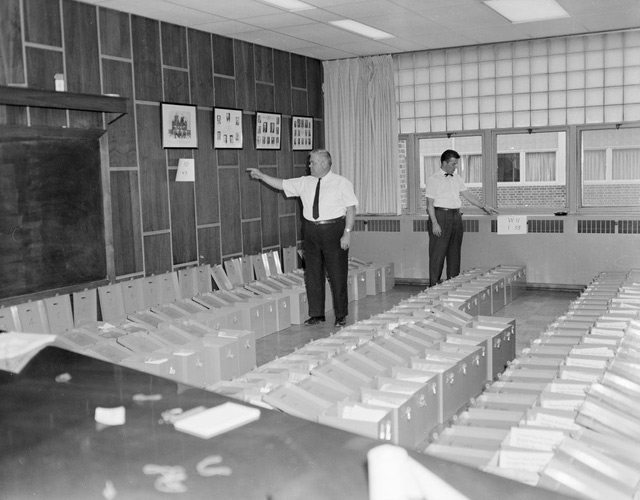 Ballot box preparation, Township of North York office at 5000 Yonge Street, 1964. City of Toronto Archives, Fonds 217, Series 249, File 261, Item 1. For most of Toronto’s history, the privilege of voting in municipal elections belonged to an elite group. If you were male, 21 or older, and owned a certain amount of property, you automatically gained membership. If you were a male tenant, or a woman in general, the road to getting the municipal franchise was long and frustrating, often pitting the city against the reluctance of Queen’s Park. That the Aldermen and Common Councilmen of the said City shall be elected respectively by the majority of votes of such persons being male Inhabitant Householders within the Ward for which the Election shall be holden, or the Liberties attached thereto, as shall be possessed at the time of the Election, either in freehold or as tenants for term of years, or from year to year, of a Town Lot of Dwelling-house within the said Ward or Liberties: Provided always, that a portion of a House in which any Inhabitant shall reside as a Householder, and not as a Boarder or Lodger, and having a distinct communication with a street by an outer door, shall be considered a Dwelling-house within the meaning of this Clause: And provided also, that no person shall vote at any such Election, who has not been a resident Inhabitant with the said City or Liberties thereof, for the period of twelve calendar months, and who had not resided within the Ward for which the Election shall be holden, or the Liberties attached thereto for the period of three calendar months next before the Election. The minimum monetary property value set by the province varied over time. Amendments under the Municipal Corporations Act of 1849 set the minimum at 50 pounds (pre-decimalization); by the time a revised Municipal Act passed in 1866, the minimum was $600, later reduced to $400. The ownership restrictions effectively shut out the city’s growing working class, despite calls as early as the mid-1860s to extend voting rights to all male taxpayers aged 21 and older. Although women chose educational trustees as early as 1850 (since schooling was seen as a domestic concern), getting the municipal vote took nearly half a century. The fight for women’s suffrage gained traction after women’s property rights were officially recognized in the early 1870s. Organizations such as the Toronto Women’s Literary and Social Progress Club (TWLSPC, founded by pioneer suffragette Dr. Emily Stowe) urged city council to petition the province to extend the vote. Defenders of the status quo made ridiculous arguments against doing so: women lacked the mental capacity to comprehend politics, extending the vote to women would destroy marital bliss, the whole political process was too degrading, and virtually every other misogynistic complaint you could think of. There were even fears that allowing women to cast ballots would disrupt child-rearing. “Some people think it will take women from the fireside, and cause them to neglect the babies and spoil the dinners,” observed a TWLSPC member during a meeting held in the city council chamber in March 1883, “but there need not be much fear that our absence will greatly affect our domestic concerns.” The TWLSPC soon renamed itself the Canadian Women’s Suffrage Association, and fought for the vote at all levels of government. 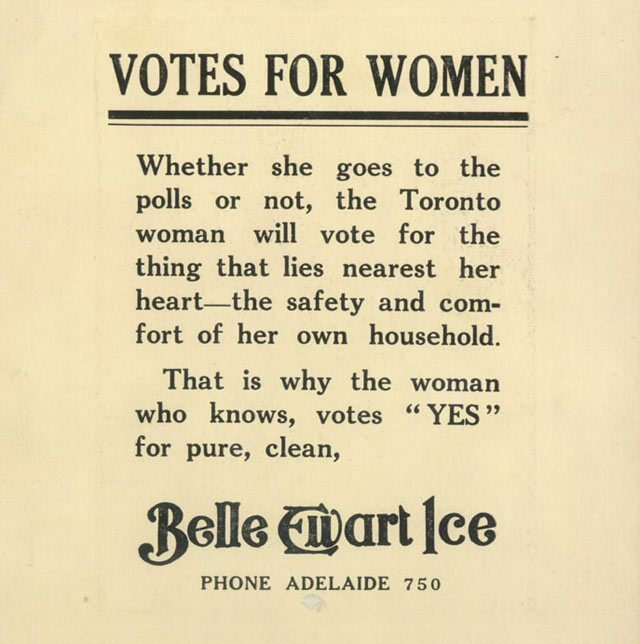 1914 calendar advertising Belle Ewart Ice Co. with reference to women’s suffrage. Toronto Public Library. In March 1884, Queen’s Park passed legislation that allowed women to vote municipally, though the franchise was restricted to spinsters and widows, and only those who met the same property ownership qualifications as men. It was believed married women, even if property was held in their name, would be represented by their husbands at the ballot box. Two weeks later, council voted unanimously to apply to the province to extend the franchise to married women. Mayor George Reginald Geary originally insisted on a rider that recommended that if a couple was jointly assessed for taxes, only the husband would vote. Sensing the mood, he consented to dropping it. Fifty women were on hand for the vote, but only after councillors gave up their seats to allow more to enter a council chamber packed that day for a separate debate on legalizing Sunday tobogganing. But the province didn’t feel like rocking the boat. When three proposed bills allowing women’s suffrage were defeated in the legislature on April Fools’ Day 1913, Premier Sir James Whitney noted that they were contrary to British precedent. “The restriction of the franchise to men is a good custom that is quietly helping to corrupt the world,” an editorial in the World noted, “and it will have to change.” Married women were granted the right to vote in provincial elections in February 1917, but they had to wait until the passage of the Municipal Franchise Act in 1922 to vote in municipal elections. Advertisement, the Globe and Mail, November 9, 1956. Throughout the 1940s and 1950s, calls to update voting qualifications grew louder. The existing laws allowed tenants to vote only if they met absurdly convoluted qualifications. In 1949, for example, the Municipal Act stipulated that tenants had to rent two or more rooms that could be assessed for at least $400 worth of taxes, and in which they regularly cooked and slept. If an adult lived in their parents’ home, they were disqualified from voting if they ate meals in the parent’s portion of the residence. Extending the franchise to tenants was seen by some as a blow to the ego of taxpayers. 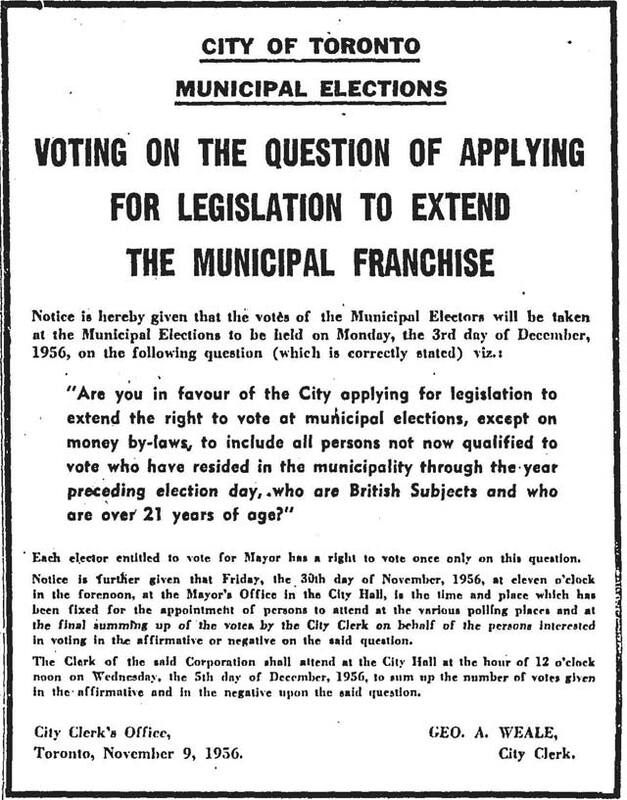 In a referendum during the 1956 municipal election, Torontonians were asked if they would allow city council to request the province extend the franchise to all people 21 or older who had resided in the city for at least a year and were British subjects. The ballot question exempted public votes on money matters, which would continue to require proof of property ownership. By a two-to-one margin, voters approved of the idea. City council reacted swiftly. Another referendum question was placed on the 1958 municipal ballot; it passed by an even larger margin than the last one. In response, Queen’s Park allowed an extended franchise (with some lingering restrictions) to be implemented in 1960, on condition that a pricy separate voters list prepared by a separate enumeration team was maintained for newly eligible electors. The move reeked of spite. Over the course of the 1960s, city council worked on proposals to base voter qualification on residency instead of the few remaining property ownership restrictions, most of which were abolished years earlier for federal or provincial contests. These efforts caused at least one right-wing councillor to cry “Communism!” Loosening the franchise occurred gradually in the suburbs within Metro Toronto, though communities like Scarborough resisted as long as possible. Advertisement, the Toronto Star, October 26, 1972. The piecemeal process of reform ended in June 1972, when the province passed the Municipal Elections Act. The new legislation lowered the voting age to 18 and removed the last property value qualifications—the main requirement was Canadian citizenship or being a British subject (the latter a right Toronto retained into the 1980s). The city’s current voter qualifications reflect these changes; they also allow non-residents who own or rent property within the city’s borders to vote, which some observers say is a means of padding the electoral rolls. Current efforts to extend the vote to non-citizens are not without historical precedent. 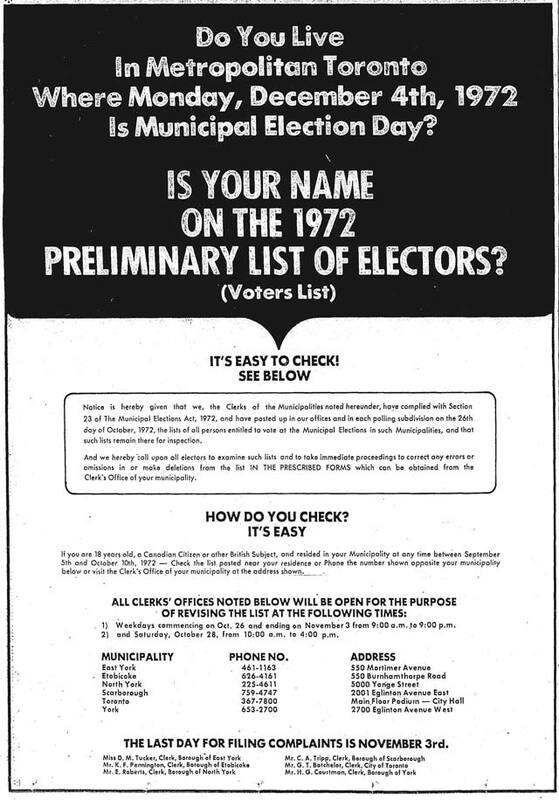 In 1971, councillor Joe Piccininni proposed allowing non-citizens who owned property in the city to cast ballots. The idea was attacked in letters to the editor by those who argued that the right to vote is one of the few incentives to become a Canadian citizen. Yet, as Ryerson University political science professor Myer Siemiatycki pointed out in a 2006 report on voting and social inclusion [PDF], nearly 16 per cent of Toronto’s population was ineligible to vote due to lack of citizenship. Will this group bring about the next stage in the evolution of our municipal franchise? Additional material from Mayor Howland: The Citizens’ Candidate by Desmond Morton (Toronto: Hakkert, 1973); Statutes of His Majesty’s province of Upper Canada, passed in the fourth session of the eleventh provincial Parliament of Upper Canada (Toronto: Robert Stanton, 1834); The Muncipal Franchise and Social Inclusion in Toronto: Policy and Practice by Myer Siemiatycki (Toronto: Community Social Planning Council of Toronto, 2006); the August 30, 1866, March 7, 1883, January 12, 1912, and January 23, 1912 editions of the Globe; the April 29, 1938, July 27, 1938, December 1, 1949, June 9, 1961, May 10, 1962, and April 21, 1972 editions of the Globe and Mail; the March 25, 1958, December 16, 1958, April 12, 1960, December 9, 1971, and December 13, 1971 editions of the Toronto Star; and the April 2, 1913 edition of the Toronto World.